Everything is coming up roses in the buckled landscape of Jabal Akhdar. The terraces wrested from limestone are painted in stripes of pink. The breeze coursing through the mountains sets petals aflutter. The oil evaporating from the blooms bathes the valleys in its scent. It's rose harvest time in the Arabian nation of Oman, a brief season in which the Al Hajar mountain range is transformed into a contradictory blend of supple and parched, delicate and serrated, colourful and wan. In springtime damask roses emerge implausibly from the stony landscape, speckling the terraces in flashes of pink. It's a magical time in this precipitous realm, a brief period from around the end of March to the end of April when the secret to Omani's love affair with scent is illuminated by the buds sprouting from its mountainsides. Located south of the country's capital, Muscat, the region is a hub for rose oil and rosewater production. 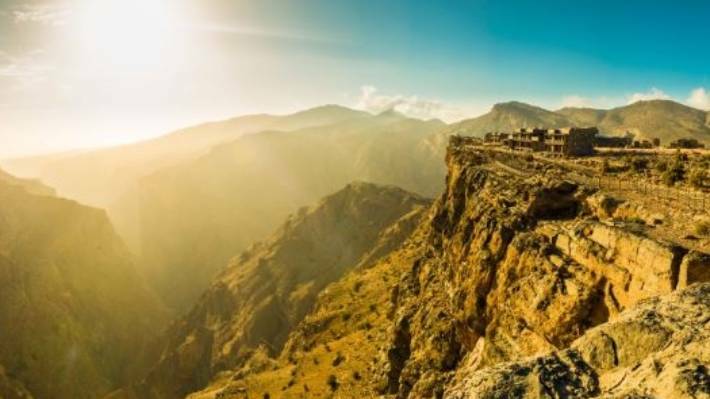 Towering over this fragrant industry from its cliff-edge location is Alila Jabal Akhdar​, an enchanted retreat that seems to capture all that rose essence as it floats heavenwards. Alila Jabal Akhdar​, high in the hills. There's the spritz of rosewater and elderflower guests receive upon arrival, the rose petal baths in the rose oil-scented spa, the sparkling rose and the rosewater-infused martini – my personal favourite – sipped in the Rose Lounge as the setting sun inflames the valley with its rosy glow. There are other scents, too: frankincense, the sap of which is used for perfume and medicine, olives and wild rosemary used in cosmetics and cooking. And the coffee, of course, poured in thick drafts everywhere I go. It's mid-morning now and I'm following guide Malik Al Amri through groves of pomegranate, apricot, myrtle and fig, balancing on the spring-fed irrigation channels, or aflaj. We come to the walled rose garden in the village of Al Akar and cradle the few blooms left behind. The farmers have long gone, trailing home along the terraces to their houses, sacks of plump rose petals flung across their backs. 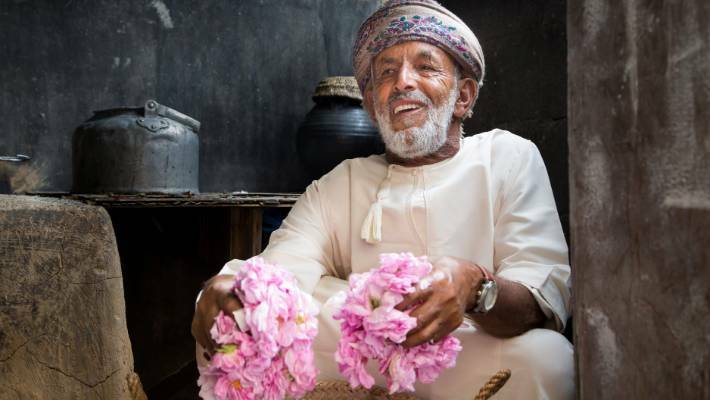 The Jabal Akhdar region is a hub for rose oil and rosewater production. "They must harvest before sunrise," explains Al Amri, "before the petals lose their perfume." In an alcove off a village alleyway an old man offers us a bowl of dates and thimblefuls of the rosewater-spiked coffee so redolent of Omani hospitality. I taste in it the roses we've passed in the walled garden and detect in its steam the essence which is distilled in the smokehouses dotted around this village – tiny wattle-and-daub structures in which rose oil is extracted the traditional way (except for the use of gas instead of wood fire). From up here we look down on the valley stepped with terraces and filled with lemony-green pomegranate groves and the pink flecks of now-withering rose petals left behind after this morning's pre-dawn harvest. From such unlikely beginnings, I marvel, these floral offerings will go far: to the souk in Nizwa, where their dried petals will be sold in barrels. To households across Arabia, where they'll be steeped in water and sprayed onto temples to alleviate headaches, or added to dishes of halwa and pots of coffee. And, in the most prized journey of all, to Oman's royal perfumer, Amouage, in Muscat, where their essence will be alchemised into exquisite scents and shipped to the furthest corners of the world. Catherine Marshall travelled as a guest of Oman Tourism.